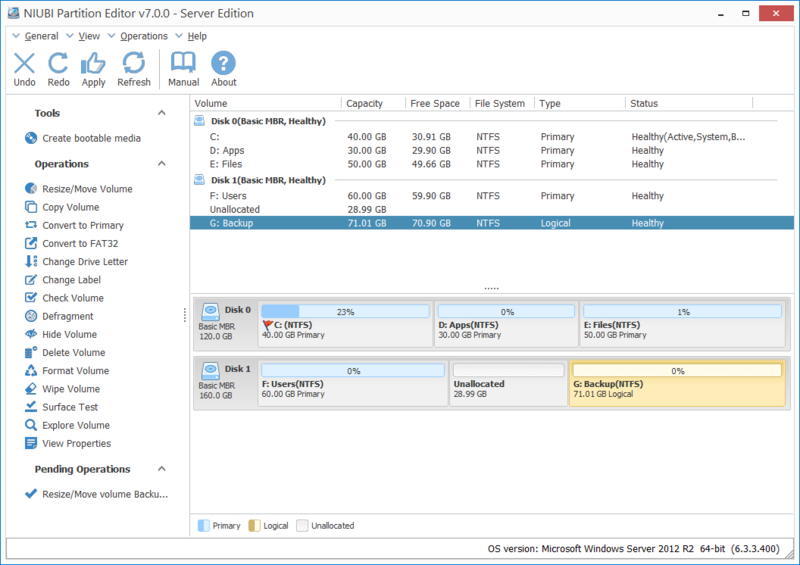 Partition Magic Server Edition for Windows Server. to ensure 100% data safety. Support all types of HDD/RAID, VMware/Hyper-V, USB disk and cards. 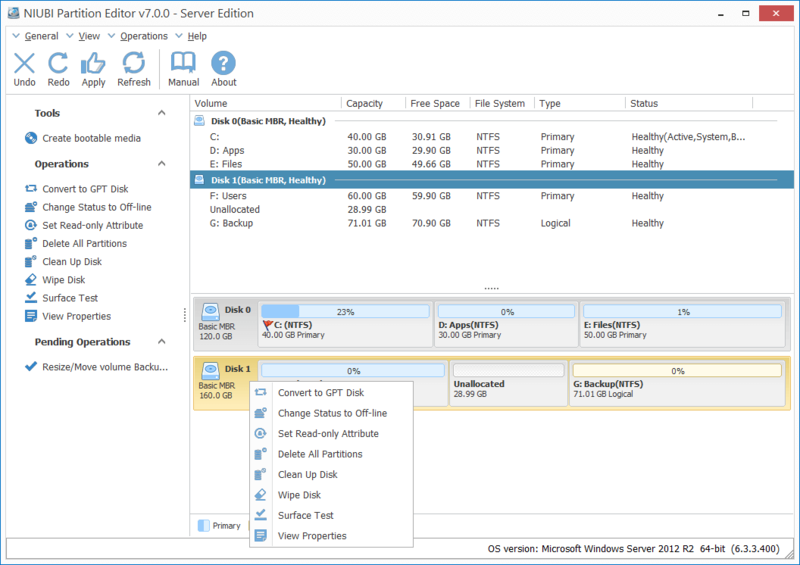 Reliable Disk Partition Manager for Windows servers. 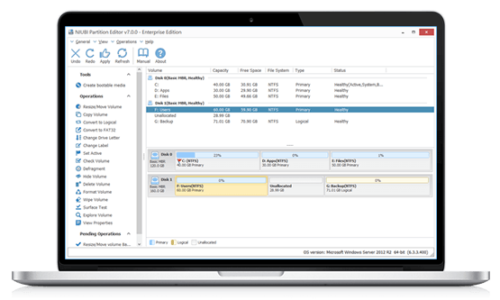 NIUBI Partition Editor Server Edition is compatible with Windows Server 2016/2012/2008/2003 and Windows Small Business Server (SBS) 2011/2008/2003 (x86 and x64). All types of hard disk drive, VMware, Hyper-V, all type of hardware RAID array are all supported. 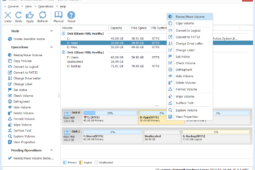 This magic partition software helps you extend C drive, change partition size, split and merge partitions to optimize disk space usage, keeping Operating System and all files intact. 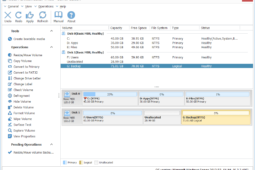 This server partition manager is not only a partition resizer, but also a toolkit to do complete disk partition management to improve server performance. Built-in Roll-Back data protection technology to ensure 100% data safety. Extend NTFS system partition without rebooting. Resize partition 30% – 300% faster than ANY other tools. The choices of many Fortune 500, governments and universities. 24*7 live chat support and 90-day money back guarantee. 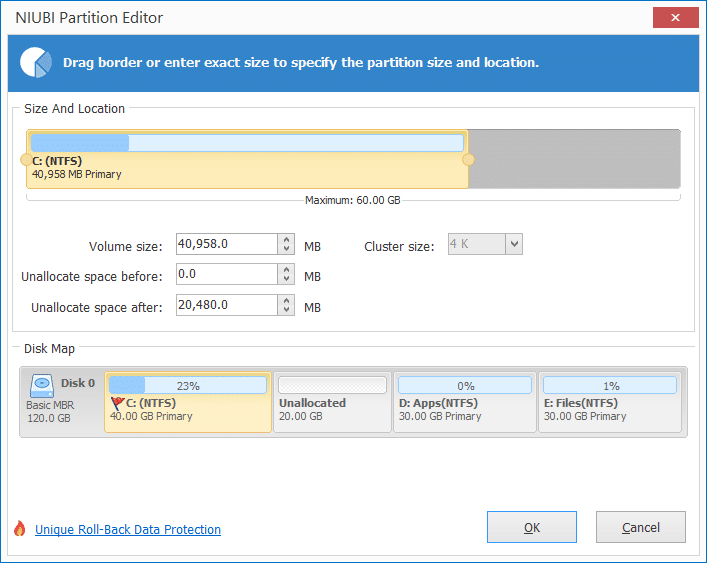 Change partition size directly and safely. What to do when there is not enough free space in system C: drive, waste a whole weekend to start from scratch? NO! Our product helps you extend partition by taking free space from another one directly. Roll-Back technology to protect OS and data intact!. Extend NTFS partition without rebooting. Easy to use with simple GUI. Data safety and time are most important! 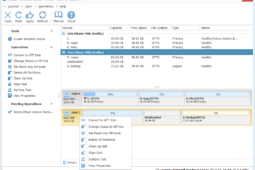 With Resize/Move Volume feature, you can easily combine two smaller partitions into a larger one. By Resize/Move Volume feature, you can also split a large partition into smaller one, all files remain in original partition. Copy Volume helps completely clone a single partition to backup or migrate data. Supports copying to smaller or larger disk. Supports copy between physical disk and RAID virtual disk. Ability to change target partition size while copying. Download demo to see how easy and powerful it is. Convert MBR disk to GPT without data loss. Create bootable CD/DVD, USB disk without installing again, or in case of system boot failure. Wipe entire disk, single partition or Unallocated space to prevent your sensitive file from recovering. 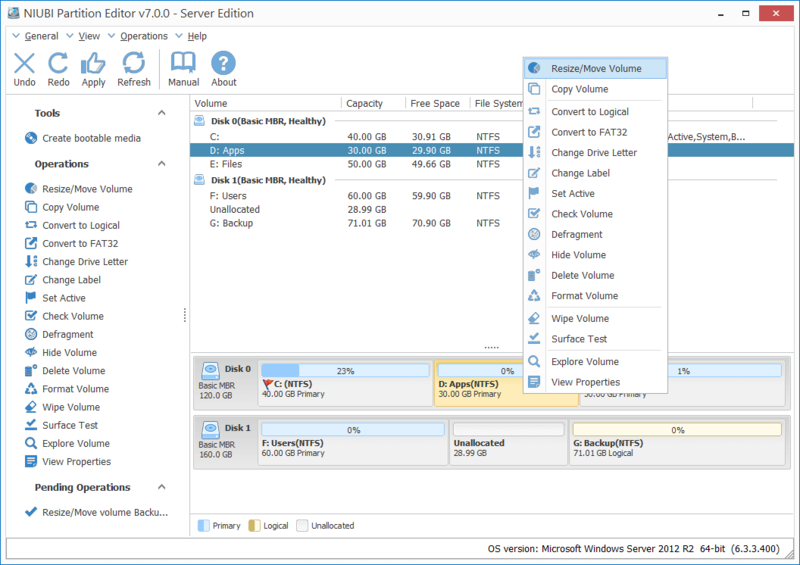 Create new partitions with free Unallocated space. Label Partition is used to assign a name to partition for easier recognition. Hide partition to prevent important data from unauthorized accessing. Set Active Partition is used to specify a partition to be the boot partition. If you would like to check and recover file system to ensure the integrity of your files, you can use the Check Volume function. This function is used to view detailed parameter of a disk or partition. By defragment, the partition read and write performance will be improved. Set read-only attribute is useful to improve the computer or server security, prevent from unauthorized file uploading. A new hard disk should be initialized before creating partitions to use. This feature is useful to identify if it is the right one you want to operate. This function is used to remove all partition, un-initialize a disk to use as new. A bad sector is a sector on a computer’s hard drive that has been damaged and has lost the ability to write and retrieve data. Bad sectors can sometimes corrupt your saved data as well as slow down your computer. In order to improve the performance of your computer, you can use the Surface Test function to your hard disk. (This function cannot repair bad sectors). In order to access the files and folders more accurately, Windows typically assigns a letter of the alphabet to most drives (C: D: E: etc.). However, confusion may occur among those drives letters when you finish upgrading computer system or connecting multiple hard disks. If you want to bring order out of chaos and reorganize your drives in a certain way, changing the drive letter can be the most effective way. Support is ready for you 24*7, contact us via live chat or send message directly.